The Lower Riser Assembly attached to the top of the BOP, the riser has folded over to the left. I described the plan of attack in an earlier post, and what has happened, over the course of today has tried to follow that script. I say tried, because there have been a couple of glitches develop over the course of the day. The large shearing machine (apparently owned by BTI) appeared on the scene, and in preparation for its use some of the pipes surrounding the main riser (the choke and kill lines) were first cut away using a diamond saw. 10:04 am just before the pipe was severed. At the same time that this was going on, the wire saw that would make the final cut on the riser had been brought down to the site. The riser assembly has been cleaned of extraneous pipes already, and the wire saw would fit about the flange and below the bend. The wire saw was then located ready to make the cut. It was now time for the shearing machine (which I’m going to call a Shear from now on) to fit around the riser and to make the first cut through the pipe. Unfortunately the first cut did not appear successful, although there was a cloud of oil and gas released, indicating that the riser was at least breached. There was a pause, and the Shear moved to a new location closer to the riser. Again it tried to shear through the nest of pipes, that now included choke and kill lines. It was not successful, and returned to the surface where it will be either repaired or replaced. (There may be some problem with the hydraulics since it should have been able to handle the job that it was given). It (or a substitute) will likely make an appearance again before long. Well I went away for a couple of hours and thus missed the shear coming back and cutting through the riser. This was the moment (recorded on Youtube) when the two parts of the riser separated. Just after that the wire saw was activated. It appears, at 10:45 pm, to be half way through the riser. I'll try and note when it it done. 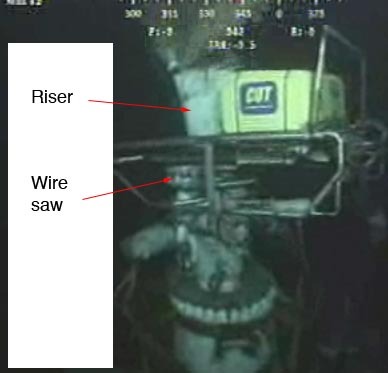 In the meanwhile, a little calculation, based on reports that the White House has announced that the removal of the riser and drill pipe that are protruding from the Blowout Preventer (BOP) of the Deepwater Horizon well in the Gulf may increase flow by 20% when the riser section is removed. There are two immediately obvious reasons why this might be the case. The first of these is that there is a small amount of oil that was leaking up through the drill pipe that extended beyond the broken riser. That flow was one of the first things capped in the remedial effort. It did not have much impact on the overall flow volume, since the flow merely backed up and increased the flow through the main crack in the riser, but there may be a small increment of flow when this channel is re-opened with the cut below the fold in the riser. The greater change in the flow, however, will likely come because the riser and DP, while not providing much increased resistance, did raise the pressure on the downstream side of the BOP by about 500 psi. We know that though the pressure down at the formation was at around 12,000 psi up on the upstream side of the BOP it fluctuates in the 8,000 to 9,000 psi range. The higher resistance on the downstream side, reduces the pressure drop across the BOP by that 500 psi, and the flow rate will be reduced accordingly (the gap size through the BOP is assumed not to change). However, if the pressure drop across the nozzle was at 6,000 psi in the current condition, (which with an orifice size of 0.6 inches, would give a flow rate of 512 gpm) then raising the pressure drop by 500 psi would only increase the flow rate to 532 gpm, or a difference of 4%. Which might suggest that there is something about the drill-pipe flow that was initially capped which we don’t know yet. Alternately it may be that they think that removing the bend in the riser might ease the forces on the BOP, relaxing the metal a little and increasing the orifice size. After all it has only to open up by another 0.05 inches to give the increase in flow that the EPA are predicting. Oh, and I mentioned earlier that an ASJ system had cut through casing and pipes at the bottom of the North Sea. I had the orientation of that cut wrong (at least for the picture below) since in this case it was from the outside in, but I am aware of it being successful the other way. And so here is the picture of casing and cement cut by an ASJ. Sadly it was so long ago - around 23 years, that I can no longer remember exactly the pressure it was cut at, but I believe it was 5,000 psi. UPDATE: The wire was apparently stuck for a number of hours and they may have changed the wire, and then restarted with a second cut. BP is still predicting that the cut will be completed today and the LMRP installed. The technician said that rather than trying again with the saw, the plan now was to use a large shear to cut the riser. 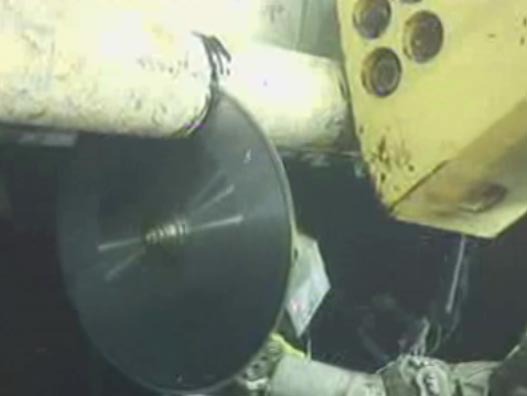 The shear, which is about 20 feet long and nearly 10 feet high, was used to make an earlier cut in the riser about 50 feet from the wellhead. 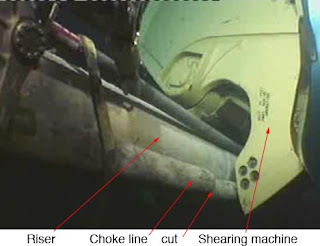 Because the shear will not make as clean a cut as the wire saw, modifications would have to be made to the containment cap that is to be lowered over the cut pipe. But the technician said that even with the switch to the shear and the modifications, he expected the containment cap could be in place by Thursday. "on the upstream side of the BOP it fluctuates in the 8,000 to 9,000 psi range"
HO -- can you point me to a source on that? There have been some reports in the media that suggested a much lower pressure below the BOP. But given the complexity of the situation and confusion in the media, those reports could certainly have been inaccurate. Thank you for your informative and fascinating posts on the Deepwater Horizon oil spill and actions that BP are taking to try to stop the spill. Your posts explain the technical aspects in a clear and understandable way. In reading the posts and tech articles, I have come up with a few questions on the oil drilling industry in general. 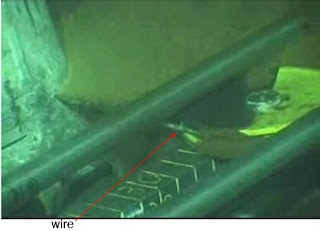 The Deepwater Horizon was busy sealing the well and going to disconnect from the well. BP would open the well again later for production. 1) When the well was sealed would the blow out protector (BOP) remain at the well or would it have been removed? 2) How would BP have re-opened the well later? 3) We know that the BOP failed to close the well in this case. If the BOP had worked correctly and closed the well, could the well be re-opened again or is it abandoned after the activation of the BOP? 4) How are the relief wells guided to meet the blown out well? From what I have read, this sounds almost like trying to hit a piece of cotton thread from a few hundred yards away while blindfolded. The sizes of well I've read about range from 3 inches to about 30 inches diameter; all very tiny targets at ranges of 10000 plus feet! 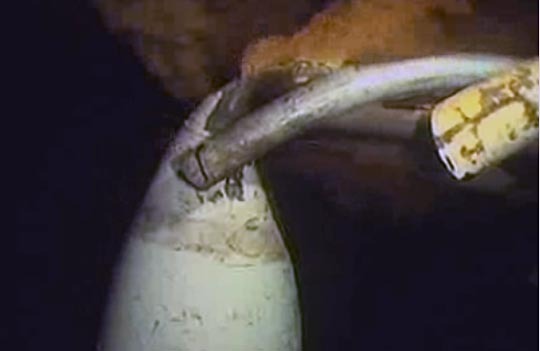 Andrew -- re your Q1: the BOP would have been removed when the well was temporarily abandoned. The BOP stack is part of the drilling system, and goes with the rig. 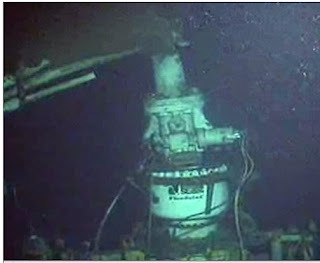 The temporarily abandoned well would have been completely safe because there would have been a number of separate barriers between the high pressure oil reservoir and the sea floor. 1. The reservoir should have been completely isolated on the outside of the well's properly cemented steel casing. (That's the root of the problem in the Macondo well -- it was not). 2. The wellbore would have been filled with dense mud, such that the mud pressure at the bottom of the well would have been higher than the formation pressure, to prevent anything leaking in even if there was a flaw in the cemented casing. (That was another problem at Macondo; BP started to remove the heavy mud before being absolutely sure that the well was stable -- like taking away the safety net while the high-wire act was still going on). 3. & 4. 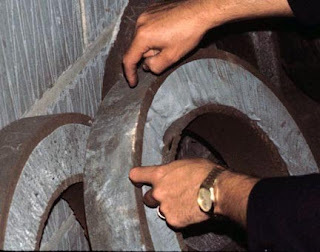 There should have been two (or more) long cement plugs inside the casing at different depths, such that even if there was a leak into the well and gas bubbled up through the mud, it could not have gone far. 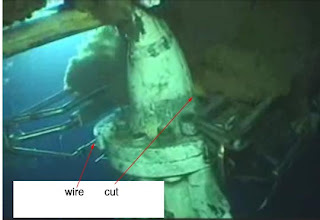 About your Q2, the rig that arrived later to put the well onto production would probably have installed the permanent wellhead on the sea floor with the flowline leading off to the production facility (wherever that would be). Then installed a BOP on top of the wellhead with a riser back up to the rig, re-entered the wellbore with a drill bit, drilled out those cement plugs, and circulated out the mud with clean low-density completion fluid. 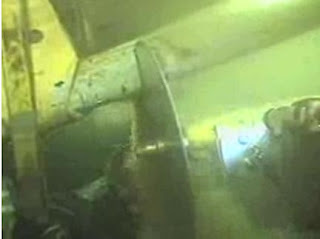 Blow some holes in the steel casing at the appropriate depths ("perforate"), maybe flow the well to clean out the debris. Then close the (multiple) valves on the wellhead, pick up the BOP and move on to the next job. It has been done successfully literally thousands of times. 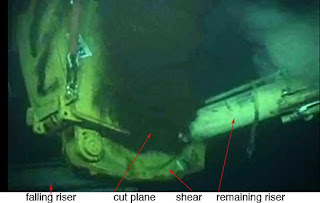 Q3 -- If the BOP had closed successfully, then eventually there would have been something similar to the "top kill" -- with heavy mud being pumped at high pressure below the BOP rams through the "kill" line. (It is called that for a reason). The high pressure pumps would have bullheaded the oil back down the well into the reservoir and filled the well with dense mud, putting it into a safe condition. Q4 - How are relief wells guided? Very carefully! Directional drilling is very common, onshore and offshore, in the oil & gas industry and beyond. (You may have noticed that utility crews don't dig up roads so much any more when laying pipes and lines -- they drill directionally under the road). For oil wells, directional drilling technology is high tech & complicated, with specialized tools and staff on the rig to guide the activity. But the process is well understood, and used very successfully every day. Remember the relief well doesn't actually have to hit the steel casing of the blowout well -- just get close enough so that the dense fluid they pump down the relief well into the reservoir gets sucked up into the blowout well. Kinuachdrach, thank you for a very informative answer. I was under the impression that the relief well had to interesect the blown-out well, like a water line tee piece. It also explains why the relief well will take so long to drill; it has to go down the same depth as the original well. I also conclude that a blow-out is something to avoid at all costs as the well cannot be recovered. All the time and money spent in drilling the well can be lost in a short time if it blows out.